It's designed specifically to kick in when the power goes out. And here in sunny south Florida, the power goes out frequently during the summer thunderstorm season. This emergency flashlight stays plugged in to your wall outlet, so it's always charged up and ready to go. It automatically turns on when the power goes out or when you unplug it from the outlet. So, when the power suddenly goes out at night, you automagically have some light in the room to move around safely, even if all you're doing is going from your living room upstairs to bed. 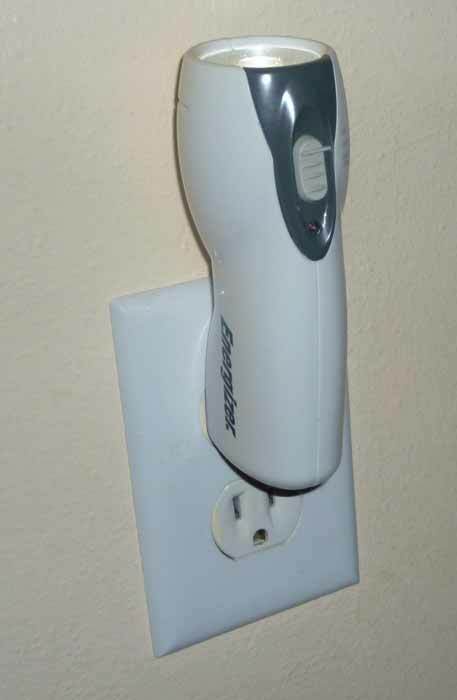 You can see to go to the wall outlet where this flashlight is plugged in, remove it, and then with the flashlight in your hand you can walk around your house safely. Or if the power goes out while you're out and about, you don't come home to a completely dark house. It has three modes selected by a sliding switch: The first is the standard "On" position, with "On" meaning "emergency standby": The light is off when the unit is plugged in but automatically turns on when the power goes out. The middle setting is "Off/Charge" — it stays charged while plugged in but never lights up automatically. The third setting is "Nightlight/Charge" — it stays on in nightlight mode with low illumination while plugged in, whether the power's on or off. There's no light sensor, so in nightlight mode it's on around the clock. Nightlight mode is great for areas of the house where you always want a little bit of light. Emergency standby mode is best for areas where you don't want a permanently on nightlight but want the light to come on when the power's out. Many of the emergency flashlights that are available have only two modes, "off" and "nightlight" mode. I wouldn't want one of those in my bedroom, because I like my bedroom dark. When the power goes out, it automatically turns on with its high illumination setting. You can then go get it from the outlet where it lives and use it as a regular flashlight. You can slide it to the low setting, which is a little bit brighter than a standard nightlight, or use it on the high setting, which is almost as bright as a regular flashlight. The high setting projects a bright focused beam that lights up an area about 3 feet in diameter from about 12 feet away. Once the light comes on, it'll go for 2 hours on the high setting, or 15 hours on low. One nice aspect of this emergency flashlight is that it doesn't cover both outlets when you have it plugged in, so you can still use the outlet for other things, and you can plug it in pointing upward or downward. Also, the battery is user-replaceable, so you don't have to throw away the whole unit when the battery finally reaches end of life. Many of the emergency flashlights available are disposable units without a user-replaceable battery. The plug part folds into the handle and out of the way when you're using it as a flashlight. The end of the unit opposite the bulb end is flat, so you can stand it up on a table or countertop to throw light upward. Power outages are always at least mildly annoying, but they're less so when you're prepared. I'm happy to be prepared with this little emergency light.